Prospective Hearts owner Ann Budge says sorting out red tape over small shareholdings will delay by weeks the process of exiting administration. But the millionaire Edinburgh businesswoman hopes to complete the process by the start of next season to avoid any football penalties. Some fans who bought a stake in the club's last share issue have yet to receive their share certificates. "This is something I am totally committed to rectifying," she said. Budge aims to complete a £2.5m takeover by the end of next month after Hearts' largest creditor, Ukio Bankas, which held a 29.5% stake as well as security on Tynecastle Stadium, agreed to sell its shares to her Bidco 1874 company. The businesswoman had agreed the previous week to buy a 50% holding in Hearts from the bank's parent group, UBIG, with both Lithuanian companies in the process of being liquidated. However, in a statement to Hearts' website, she stressed that "the cooling-off period for the UBIG decision does not lapse until Sunday 27 April. This is the period when a creditor can still object to the decision." 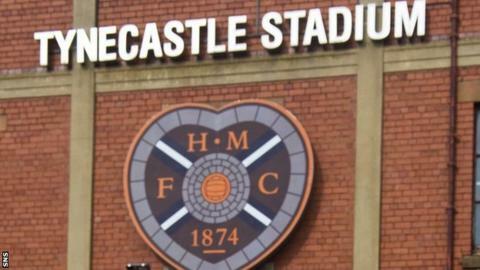 Only then will a sale and purchase agreement be signed to allow control to be passed to Budge, whose eventual aim is to transfer ownership to the Foundation of Hearts fans group. "When the SPA is signed, the club's ownership will pass from the current owners to Bidco 1874, the company set up by myself to take ownership of Hearts," said Budge. "I don't think I need to spell out to anyone that I am a fan and am only doing this as a fan with the express intention of passing ownership over to the wider supporter base, via FOH, over the course of the next few years." Legal agreements will then be signed between Hearts, Bidco 1874 and FOH that will ensure ownership can ultimately pass to the supporters. "Bidco 1874 is obliged, due to stock market rules, to make a general offer to all shareholders for their shares," Budge pointed out. "This means any of you who hold any shares in Hearts will be written to, offering to buy your shares on the same terms as has been offered to UBIG. "For legal reasons, this will delay the formal leaving of administration for a few more weeks. "During the period between the signature of the SPA and the formal end of administration, there will be a management agreement put in place to allow the new owner, Bidco 1874, to get involved in the running of the club." However, Budge expects final negotiations and legal processes to be completed so Hearts, who have been relegated to the Scottish Championship, avoid a repeat of the 15-point penalty and signing embargo imposed this season for being in administration. "We are all very confident that this work will be completed well before the start of next season to avoid the possibility of any further football sanctions," she said. Budge explained that her statement was designed to clarify a number of concerns fans might still have over the takeover process. "One that I do want to answer now is the question relating to those supporters who paid for shares in the last share issue and have never received their share certificates," she added. "I will address it as soon as I am in a position to do so."